Browse Artists and Groups André Biéler, LL.D., R.C.A., O.S.A. Born on October 8, 1896, André Biéler was a well known Canadian painter, member of the Beaver Hall Group, teacher of art and Canadian war veteran. 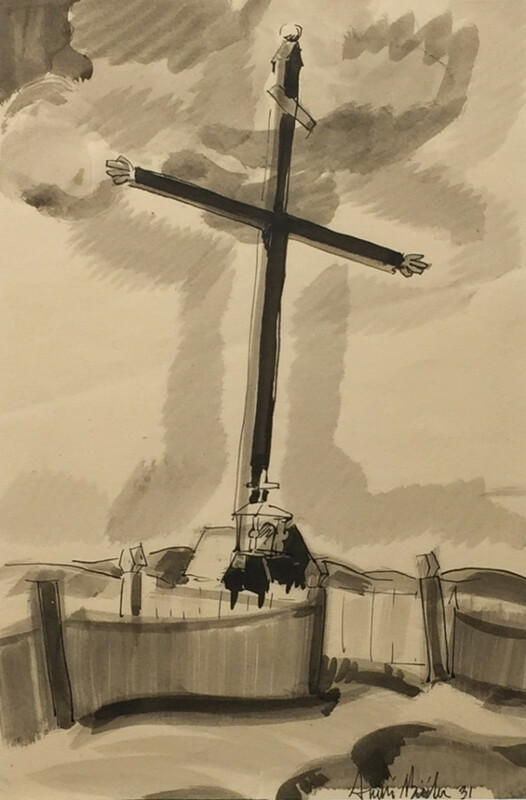 André Biéler's first opportunity to seriously take up art came with the onset of the First World War. He enlisted in the spring of 1915 with the First University Company, P.O.C.L.I.. He was wounded in 1916 at Sanctuary Wood and in 1917 left the regiment, after the Battle of Passchendaele, having been badly gassed. He worked at the headquarters of the Topographical Section as a map draughtsman with the rank of sergeant until the end of the war when by then, he had risen to head of the section. With every member of the staff painting and drawing in their spare time and with exciting visits from Maurice Cullen, Frederick Varley and other Canadian artists, his interest in art was roused again. When Biéler returned home he applied his war veteran's gratuity to a three-month course at the Art Students' League in Woodstock, NY. He chose this instead of the alternative—a year at the Ontario College of Art, proposed by the education officer. Most of the students were young war veterans like himself, all keen and inspiring to each other and by the teachers—painters George Bellows, Eugene Speicher and musician Charles Rosen. Back home in Montreal, Biéler was restless. He found no inspiration in William Brymner at the Art Association School so at last he decided to go to Paris. He studied at the École du Louvre with Paul Serusier and Maurice Denis and enhanced his experience by going to Switzerland and working with his uncle. Painting in the Town Hall of Le Locle in the Jura Mountains, Le Corbusier's country, Biéler learned how to plan large murals and how to handle fresh mortar, becoming well schooled in the techniques of the true fresco. On his return to Canada he painted in Gaspé, QC and then settled in Sainte-Famille, QC on the Île d'Orléans, just up the river from Québec City in an abandoned house, which he fixed-up and lived in for several years. Later, Biéler had a little cottage on the main street of Saint-Sauveur, QC in the Laurentians. What is probably the first true fresco in Canada as distinguished from mere mural paintings appears in Saint-Sauveur—a portrayal of St. Christopher carrying the infant Christ upon his shoulders done by Biéler in the early 1930s. In the ten years prior to relocating to Kingston, ON as Resident Artist and Professor of Art at the Queen's University, Biéler painted continuously and exhibited with Lilias Newton, Mabel May, Edwin Holgate and other members of the Beaver Hall Group of Montreal. He also exhibited in solo shows at the Ritz-Carlton Hotel and at the Art Association. Biéler became an Associate of the Royal Canadian Academy in 1942 and a full Academician in 1955. He was a member of the Canadian Group of Painters (Vice-President in 1943), the Ontario Society of Artists, Canadian Society of Painters in Water Colour and the Canadian Society of Graphic Art. He was one of the subjects in Graham McInnes' film, Sept peintres du Québec, 1944, produced by the National Film Board. Biéler began to teach night classes in Montreal with John Lyman and over the years teaching took him as far afield as North Bay, ON, Timmins, ON and Banff, AB. Biéler taught at the Banff School of Fine Arts for four summers—1940, 1947, 1949, and 1952. He has made extensive lecture tours across Canada, sponsored by the National Gallery and various other galleries and associations. The Queen's University Art Department, one of the finest in Canada, was established in 1934 with Goodridge Roberts as first Resident Artist. Biéler succeeded him in 1936 and two years later a full credit course in art was added to the curriculum. During his more than a quarter century in Kingston, ON, with his partner, Jeannette, at his side, the arts flourished and grew under his hand. In 1963, Biéler retired from Queen's University. This gave him the opportunity to devote his energy to painting full-time. He was a versatile artist who worked in a variety of media—pencil, watercolour, oil, tempera, woodcut, mural painting, collage and mosaics. André Biéler died on December 1, 1989. Source: Introduction, A Retrospective Exhibition of the Works of André Bieler 1925-1963. The Agnes Etherington Art Centre. 1963. Please send me more details about the following artist. André Biéler, LL.D., R.C.A., O.S.A.